Barrel tiles are also known as Spanish Tiles. Barrel tiles are basically semi cylindrical in shape. They are placed in interlocking patterns on a plain flat roof. The roof of barrel tiles is naturally durable. They give a very nice overall look to the whole house. These barrel tiles are available in different colors and sizes. They are very strong and durable. They hardly need any repairing because these tiles are as it is very strong. They are made up strong and long lasting material. But every type of material has its own life expectancy. After years of harsh conditions there may be little wear and tear in the form of cracks and breaks on the barrel tile roof. These minor cracks and breaks should be attended on time to avoid further and big damages. The barrel Tile roof cost is very economical. The cost includes only the cost of the tiles, labor and the most necessary and simple equipment like chain saw, hammer, nails. There is no need of any special kind of equipment to install and maintain a roof made up of Barrel tiles. This is a barrel tile roof. Here are some steps to repair the damage in a Barrel Tile Roof. First of all arrange for some gloves and goggles. You must be very careful of your safety. You must protect yourself fully while repairing the damage on the roof. The barrel roof tiles are attached to each other with the help of nails. When you spot a damage in any of the tile, carefully remove the nails that are put on the barrel tile with the help of a pry bar. Also since all the tiles are placed in such a fashion that it is not possible to extract one tile from the entire house. In such a circumstance you must use a hammer to break the tile into small pieces. Be very careful with the hammer as you do not want to break the other tiles that are perfectly fine and not damaged. After this step very carefully takes a new tile and place it in such a manner that one end of the tile is beneath an adjacent tile and the other tile beneath the other adjacent tile. After this step shave the adjacent edges of the tile with the help of a wet saw. Repeat the entire process for each and every damaged tile on the roof. 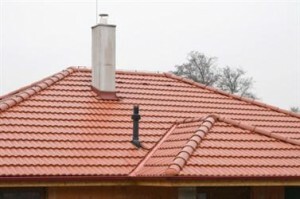 Concrete tile roof can be repaired in exactly the same manner. The highlight feature of these kinds of tiles is that they do not require a high maintenance. Since they are made up good quality and durable material, the roofs are having a very high life expectancy. Tile roof problems are the most least. Because they are very easy and hassle free to maintain. Spanish tile and ceramic tile roof repair follow the same set of instructions that are mentioned above. All these kinds of tiles have a very high life expectancy rate. They are made up of very strong and durable material. Their life expectancy is averagely about 40 years. This fact states that the Barrel roof life expectancy is very high. And this type of roof is the most ideal and hassle free roof to install on your flat roof. We have discussed the steps regarding how to repair a damaged barrel tile roof. We have also discussed about the life expectancy of different kinds of tiles. There are many types of tiles available in the market and it is fairly easy to repair the barrel tile roof if you know the procedures right.